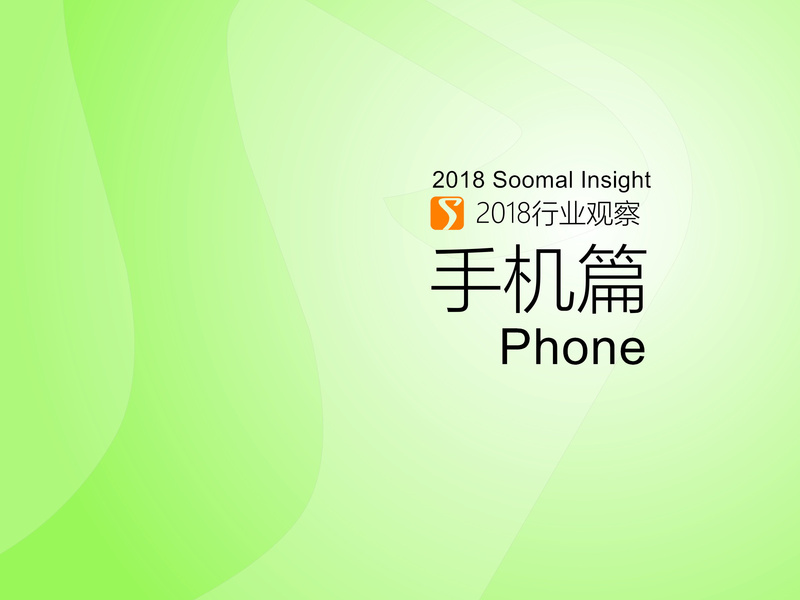 In 2018, Soomal released a total of 11 brands of 26 models of smartphone screen, audio and camera review, more than 25 in 2016 and 18 in 2017, the average price is higher than 3,000 yuan (about $450), the most expensive has reached five digits (over $1500). On the periphery of other mobile phones, there are 4 smart speakers and 1 VR device review, and there are 16 digital related science and translation articles. The year 2018 is the 40th anniversary of China's reform and opening up. The youngest full-time editor of Soomal has also experienced 33 of them. Forty years ago, school meals were exchanged for food stamps, clothes and cloth had to be exchanged for cloth, the sewing machine was hand-built, and cash began to replace the grain ticket after the 1990s.Today, as long as you slide at Amazon, the pants and shoes from all over the world will come to see you. Now, the banknotes will face a strong opponent: the mobile phone. According to the safety survey data released by China UnionPay on January 23, China Mobile has 570 million subscribers, and the average monthly consumption reached 2,600 yuan. Our daily sales such as food, clothing, housing, transportation, and medical sales can almost be solved by mobile payment. Smartphones have become integrated ultra-personal handheld terminals that integrate computers, cameras, wallets and bank cards. But the world is not only full of opportunities to change destiny, but also built various difficulties and challenges. The global economic downturn and trade wars have also brought many uncertainties to the mobile digital market. In 2018, the hardware market of China's mobile phones fell significantly. According to data released by the Telecommunications Research Institute of the Ministry of Industry and Information Technology, in 2018, the domestic market for mobile phone shipments was 414 million units, down 15.6% year-on-year, and domestic brand mobile phone shipments were 371 million units, down 14.9% year-on-year. From the model point of view, there are 587 new models of smartphones listed in 2018, a year-on-year decline of 26.5%, which means that the decline of mobile phone market is not only selling, but the user base is gradually moving closer to a few brands. According to IDC statistics, the top five brands in the mainland China domestic mobile phone market are Huawei [including Honor], OPPO, vivo, Xiaomi and Apple. Market brands have become more concentrated and even dubbed "Big 5", with 5 mobile phone shipments accounting for more than 85%.Other brands combined to ship less than 14%, including Meizu, Samsung and other brands that once had an influence in the Chinese mobile phone market. In terms of sales and profits, Apple still ranked first, while Huawei, OPPO and vivo were stable in the second echelon. During the year, the mobile phone market was transformed from the Blue Sea to the Red Sea. When the pigs that were blown up on the wind were felt on the ground, the capital withdrawal, the reduction of production and the reduction of bankruptcy and even bankruptcy became the road signs of last year's technology companies. In 2108, the most complete brand in the domestic mobile phone market was Gionee. Since 2015, Gionee's market share has fallen from top 3. Last year, bankruptcy liquidation finally began. Smartism Technology's future after the sale of R1 is unclear, some patents and the personnel were purchased by Byte Dance; Meizu even had to rely on the Zhuhai municipal government to inject capital to survive, and the Meitu brand license was acquired by Xiaomi. Although there are still 400 million sales in the domestic market, in the face of several giants in the mainstream market, the survival and development space of other brands will be suppressed, and the days will be even more difficult. Samsung once struggled with Apple in China, but Samsung, the world leader, did not become the winner of the Chinese mobile phone market, not even as good as Meizu, less than 1% in China. Although it seems that Samsung can still make money by AMOLED panels and chip foundry, but the price of SSD in 2018 fell sharply and the demand for mobile phones and PCs decreased, and the semiconductor business also suffered losses, causing Samsung to fall in both profit and revenue. Although Samsung still leads the trend of Android camp mobile phone design, Samsung's Shenzhen and Tianjin factories will be closed one after another. R&D and production will be unsustainable. Will Samsung eventually follow the footsteps of LG and gradually disappear in the Chinese mobile phone market? However, Samsung's own screen and body technology level has always led the mobile phone industry. The Galaxy S10's aperture screen design will become one of the reference targets of domestic mobile phones. Apple's 2019 first quarterly report was announced on January 30, although iPhone product sales fell 5% year-on-year, but Mac and iPad, Watch products and APP Store, cloud and other products increased revenue, the final net profit fell only 0.5%, Apple The stock price has therefore risen. Although Apple's 18-year Q4 earnings report attributed the decline in Apple's revenue to a decline in consumer demand in China and other emerging markets, it still paid enough attention to the Chinese market. HomePod is the only non-domestic voice assistant listed in China. Smart speakers, compared to the smart speakers such as Google and Amazon, do not even have Chinese voice capabilities. Even in top 5, Xiaomi's sales and market share are all down. In addition to the acquisition of Meitu's mobile phone license, the RedMi is separated into an independent company. Although the Xiao AI smart speaker and Mi Home home ecology have achieved initial success, the mobile phone business is the user base of smart home and intelligent voice. Even Xiaomi publicly expresses its dissatisfaction with the friends, the weak technology research and development capability is undoubtedly the shortest board of the current Xiaomi mobile phone barrel. Microsoft stopped the free update of Windows 10 Mobile system on December 10, 2018, which means that WP mobile phone will enter the end of life again. From 2018, application developers have basically withdrawn, and Windows Mobile's market share in mobile operating system has been stable at 0.0%. After condensing the Lumia 950XL, the essence of Nokia technology, Microsoft has not updated the mobile phone hardware for more than three years. The system stops update, which means that the Surface Phone, which has been rumored, will not appear. The Microsoft Surface product business grew 39% year-on-year. It also introduced new products such as the small Windows tablet Surface Go and noise canceling headphones but compared with the main businesses such as Azure and Cloud, the revenue of $1.86 billion is negligible. The end of the Windows 10 mobile also means the official end of the Nokia Lumia series mobile phone career starting in 2011. The Lumia series brings a different kind of simple system style and many impressive applications in the era of Android and iOS. PureMotion, PureView, Here map applications and navigation systems are among the best in the industry at the same time. After Microsoft acquired the Lumia division, Nokia, which has basically lost its smartphone research and development capabilities, has licensed its own brand to HMD and Foxconn. It is still tossing new mobile phones, and functional phones have a little residual sale. However, the products launched do not have any Lumia or technical advantages, all of them are mediocre, but after all, it has reached 2019, even if sentimentality and embarrassment are already past tense. 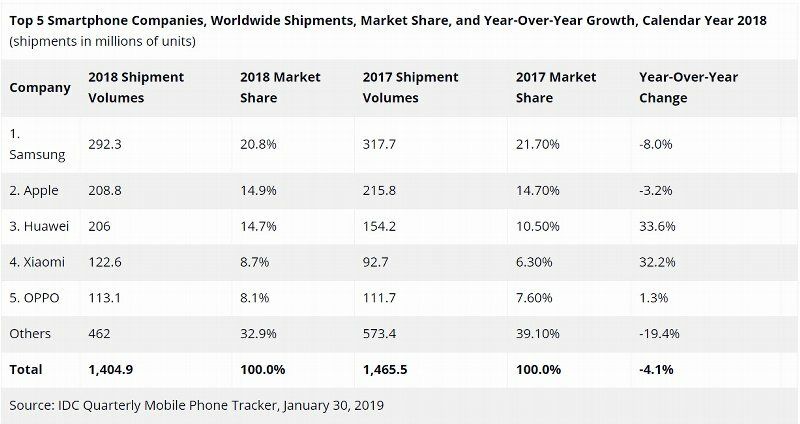 According to IDC, global smartphone market shipments fell by 4% year-on-year in 2018, and Samsung and Apple are declining. The chasers are Xiaomi and Huawei. Huawei and Xiaomi rose more than 30% last year. Xiaomi also won the 2018 Indian smartphone market, opened a large-scale mobile phone assembly plant in India, and beat Samsung in the local battlefield. In this year, Africa has been regarded as the last dividend market for smartphones, and the penetration rate of smartphones is generally only 10% to 20%.The progress of Huawei and Xiaomi is not only to eat from Apple's Samsung, but also to further occupy the living space of domestic mobile phone brands that have been marginalized in China and never appear in China. However, this is not a stable and growable market. Under the background of economic downturn and trade war, can 5G become the last trump card for the rebound of the smartphone consumer market?